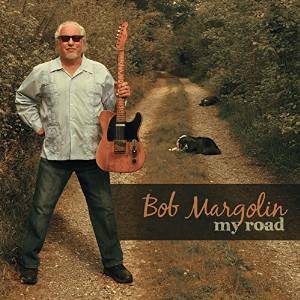 I just received the newest release (1/8/16), My Road, from Bob Margolin and it's quite interesting. Opening with My Own Life, a rough and tumble blues romp with the feel of Elvin Bishop, Bob leads on guitar and vocal with Tad Walters on harp and Chuck Cotton on drums. Ballad More and More features clean, country style picking by Margolin and nice ringing chords. I Shall Prevail has a Willie Dixon feel with powerful vocals and guitar accents by Margolin and drums by Cotton. Goodnight has the simple beauty of a primitive delta blues but with Margolin's mellow vocals. One of my favorite tracks on the release, Understanding Heart, has a Latin punch by Cotton and cool slide effects by Margolin. Very cool! Sean Costello's Low Life Blues has a solid Chicago sound with Tad adding nicely on harp. Margolin's guitar work on this track stands out nicely making this another track that really cooks. Nappy Brown's Bye Bye Baby opens with cool vocal harmonies by Margolin, Cotton and Walters. With a 50's style vocal interplay and Tad's harp work, this track has it's own sound. Rockin' blues track, Young And Old Blues has a great beat and my favorite vocal lead on the release. Margolin lays in a nice Boogie woogie guitar rhythm and tight guitar dressing giving this track top notch rating. Cowboy style ballad, Ask Me No Questions, has a really nice feel in 3/4 time with little more than a vocal harmony, harp and light guitar work. Very nice! Tex Rubinowitz penned, Feelin' Right Tonight, has a real cool rock blues feel and Walters blows hot harp riffs. Margolin trades out some really stylized guitar riffs getting the track down tight. Very cool! Devil's Daughter has a swampy feel with slide guitar and solid bass by Margolin. Another of my picks from this release features Margolin hitting some really sweet guitar riffs making the track the releases most memorable. Wrapping the release is stripped down, Terry Abrahamson penned Heaven Mississippi. With it's straight ahead delta rhythm and simple guitar riffs, this is a fine closer for Margolin's latest release.